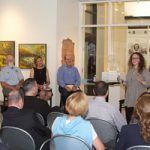 As part of the “Art of War: Gifts of Peace” art exhibit at The Box Gallery (1000 Walnut St., KCMO), the gallery hosted a leadership discussion panel on June 22. Attendance was free and open to the public. The discussion ranged from topics such as mentorship to what good leadership really looks like. Attendees had the opportunity to ask questions during the discussion. 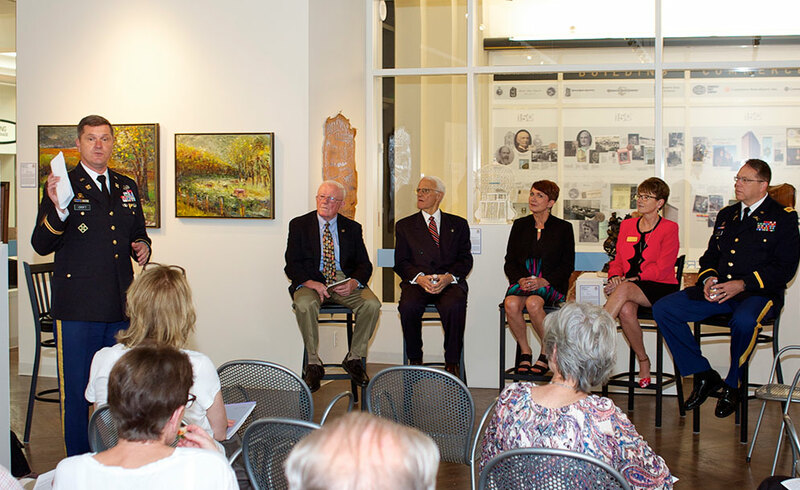 At the conclusion of the panel discussion, Col. Croft thanked the panel members and Todd Weiner Gallery representatives Meghan Dohogne, assistant gallery director, and Poppy Di Candeloro, an independent curator and researcher with the gallery, provided the gallery members with gift bags and spoke about the collection of items on display from the CGSC art and gift collection. 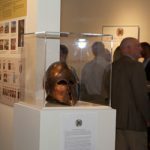 The panel discussion and the exhibit at the Box Gallery are part of the CGSC Foundation’s “Art of War Initiative.” See the About pages for more information about the initiative. 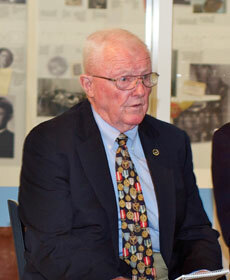 Brigadier General (Retired) Stan Cherrie was commissioned a second lieutenant of Armor in 1964 from Rutgers University. After basic and airborne training he was assigned to the 1st Squadron, 10th U.S. Cavalry at Ft Lewis, Washington, as a platoon leader in Alpha troop. After graduating from helicopter flight training he was assigned to the 191st Assault Helicopter Company and flew Huey Gunships in Vietnam in 1967-68. On his second combat tour, he commanded H Troop, 17th Armored Cavalry again in Vietnam in the American Division in 1971. As a lieutenant he commanded 3rd Reconnaissance Squadron, 11th Armored Cavalry in Bad Hersfeld, Germany from 1981-1984. He served as the chief of staff for the 1st Armored Division from Feb 1986 to June 1988 in Ansbach, Germany, then moved north to Garlstedt where he commanded 3rd Brigade, 2nd Armored Division Forward. Following Brigade command he served as the G-3 of VII Corps in Stuttgart then in Saudi Arabia/Iraq in Operation Desert Storm. He was promoted to his present flag rank in March of 1993 and served as the G-3 of the Allied Command Europe Rapid Reaction Corps in Rheindahlen Germany and then later as the assistant division commander (maneuver) (ADC-M) for the 1st Armored Division in Baumholder, Germany and Tuzla, Bosnia-Herzogovina as the ADC-M of Task Force Eagle in 1995 -96. His awards and decorations include the Distinguished Service medal, the Silver Star, the Distinguished Flying Cross, the Bronze Star, the Purple Heart, Air Medal w/V device, Air Medal – Numeral 8, and the Legion of Merit. Skip is a Distinguished Military Graduate from the University of Arizona. He received a Regular Commission (Armor) in the United States Army. His assignments included Fort Knox, Kentucky (Armor Officer Basic School); Fort Carson, Colorado (4/12th Armored Cavalry Squadron); Fort Sheridan, Panama Canal Zone (Jungle Operations); War Zone C, South Vietnam (11th Armored Cavalry Regiment) and the Staff of General William Westmoreland (Army Speakers Program). Mr. Palmer’s decorations include the Silver Star, Bronze Star, Purple Heart (2), Air Medal, Army Commendation Medal, Vietnamese Crass of Gallantry and others. Palmer is a service-disabled veteran. After leaving the Army, he joined the Walt Disney Company prior to the opening of Walt Disney World in Florida. He served as Manager of Tomorrowland, Project Manager of Disney’s third property, the Golf Resort Hotel (now Shades of Green) and subsequently, the opening General Manager. He was transferred to Anaheim and served as Director (Operations) at Disneyland in Anaheim, California. The Palmer Company was incorporated in 1980. It has served primarily as the project manager for large complex assignments. Examples include world’s fairs and expositions in New Orleans, Louisiana; Vancouver, British Columbia; Brisbane, Australia; Seville, Spain; Taejon, South Korea and Lisbon, Portugal. The company hires veterans as their project managers. After receiving the Service Disabled Veteran Owned Small Business certification, the company name became Blackhorse Worldwide. 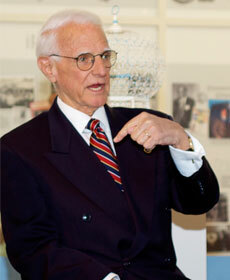 Mr. Palmer is President and Chief Executive Officer of the company. Lidia is a Licensed Specialist of Clinical Social Work (psychotherapist) with more than 20 years’ executive coaching experience. As a clinically trained holistic professional, Lidia has a track record of significantly and consistently increasing individual performance as well as improving team cohesiveness and effectiveness. 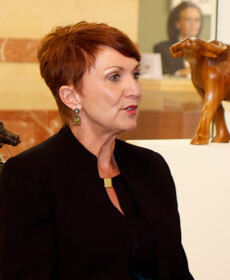 She is a seasoned facilitator and has worked with hundreds of high-level leaders, CEO’s, presidents, VP’s, directors and their management teams as well as boards of directors. She has extensive experience in root cause problem-solving, conflict resolution and management team development. Lidia is a Daring Way™ Certified Facilitator (based on the research of Dr. Brene Brown). Dr. Brown’s work focuses upon authenticity, courage and wholeheartedness as an opportunity in life and work to gain life satisfaction and true success. Karen Grekstas has more 25 years of experience in the financial services industry spanning commercial product development, sales, customer experience, operations and risk management. As Executive Vice President and Director of Commercial Products and Operations at Commerce Bank, Karen oversees all areas of commercial banking service delivery, from commercial loan operations to treasury services sales and payment product development and management. She combines strategic vision, collaborative problem solving and compassionate leadership to guide the bank through times of transformation and innovation. With creativity and discipline both, Karen drives impact for customers, partners and the bank itself. 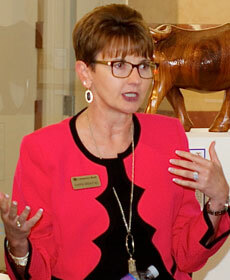 Throughout her career Karen has led the creation of new programs and improved existing initiatives at crucial times. She has responded to challenging financial markets and the need for faster payments by leading cross-functional teams to adopt new technologies for the bank, while also developing effective risk management processes. Across the areas she oversees, Karen continues to improve technology, operations and profit through innovative solutions. Concerns of security, interoperability and customer engagement shape Karen’s long-term vision, as well as her commitment to learning and embracing change. Col. King from Asheville, North Carolina; graduated from the United States Military Academy in 1988 and has served, fought and studied in Germany, Saudi Arabia, Kuwait, Iraq, Kosovo, Kentucky, Louisiana, Kansas, Pennsylvania, Afghanistan and Georgia. Col. King was assigned to 1st Battalion, 34th Armor; 2nd, 3rd, 4th and 1st Squadron, 16th Cavalry Regiment; 256th Infantry Brigade, Louisiana National Guard; HQ, 1st Infantry Division; 1st Battalion, 18th Infantry Regiment; 1st Battalion, 77th Armor; 2nd Brigade, 1st Infantry Division; U.S. Army Combined Arms Center; U.S. Army Armor School; U.S. Army War College and Resolute Support, Afghanistan. His duties include tank platoon leader, mortar platoon leader, HHC executive officer, battalion S4, AOBC Instructor, troop commander, Active Army Advisor to National Guard, battalion S3, battalion executive officer, chief observer/trainer, squadron commander, director of Armor School, assistant director of Joint Education, deputy commandant Armor School, and 194th Armor Brigade Commander. 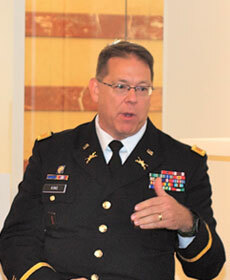 In 2015, Col. King was assigned to Fort Leavenworth as the Director of the School for Command Preparation. He later deployed to Afghanistan as the executive officer to the deputy advisor to the Minister of Defense. Upon return from Afghanistan, Col. King became the director for the Center of Teaching and Learning for Army University and recently was assigned as the acting director of the Mission Command Capability Development Integration Directorate (CDID). Col. King’s combat and contingency tours include Operation Desert Shield/Storm, Kosovo 4A, Operation Iraqi Freedom II, and Operation Resolute Support. Col. King is a graduate of the U.S. Army War College, the Command and General Staff College, and Louisiana Tech University where he received a Masters in Business Administration. He also served as President of the Fort Knox Community Schools School Board from 2008-2010 and was a 2011-2012 Fellow with the Pennsylvania Education Policy Fellowship Program. His awards include the Legion of Merit, Bronze Star Medal with oak leaf cluster, Defense Meritorious Service Medal, Meritorious Service Medal with 5 oak leaf clusters, Army Commendation Medal, Army Achievement Medal, the Saudi Liberation Medal, the Kuwaiti Liberation Medal, the Global War of Terrorism Expeditionary Medal, and the Global War on Terrorism Service Medal. Col. King’s combat and contingency tours include Operation Desert Shield/Storm, Kosovo 4A, Operation Iraqi Freedom, and Operation Resolute Support. 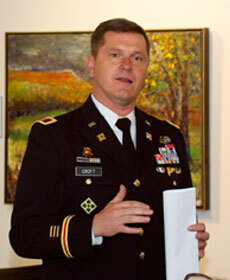 Colonel Christopher D. Croft, Sr. was commissioned in the Transportation Corps upon graduation from the University of Central Florida in 1987. Col. Chris Croft, director for the Center for Army Leadership at Fort Leavenworth Croft served in a variety of assignments including: platoon leader, 28th Transportation platoon, separate and installation transportation officer, 22d Area Support Group, Vicenza, Italy; company commander and battalion S2/3 (operations), 725th Main Support Battalion, Schofield Barracks, Hawaii; aide-de-camp in the Military Traffic Management Command and United States Transportation Command; chief of plans and exercises, division transportation officer, 4th Infantry Division, Fort Hood, Texas and Tikrit, Iraq; support operations officer, 2d Brigade Combat Team, Baqubah, Iraq; commander, 101st Sustainment Brigade (Rear) (Provisional) and battalion commander, 106th Transportation Battalion, 101st Airborne Division (Air Assault), Fort Campbell, Kentucky and Balad, Iraq. Col. Croft served for two years as the chief, Field Grade Logistics Assignment Branch and one as the chief, Force Sustainment Division of the Army’s Human Resources Command (HRC). He also served as the director, Officer Personnel Management System – Task Force for HRC prior to attending Columbia University as an Army War College Fellow. He spent his year studying leadership, leader development, and change management from one of the leaders in the field. Col. Croft is a graduate of the resident Command and General Staff College in 2000 and School of Advanced Military Studies in 2001. His decorations and awards include the Bronze Star (1OLC), the Defense Meritorious Service Medal, the Meritorious Service Medal (4OLCs) Global War on Terrorism Expeditionary Medal, the Iraqi Campaign Medal, the Humanitarian Service Medal, and the Military Outstanding Volunteer Service Medal. He earned the Pathfinder, Airborne, Air Assault, and Combat Action Badges.